The U.S.-European economic and commercial relationship is the world’s largest with $4 trillion in trade, investment, and commercial sales by foreign affiliates in each other’s markets. But as the leading stakeholders of the global economy, the U.S. and the EU should not stand still. The Chamber supports the ongoing efforts to remove non-tariff barriers to trade within the Transatlantic Economic Council - and believes the transatlantic partners can go further. The Chamber is convinced that through elimination of tariffs, services trade liberalization, an investment agreement, establishing compatible regulatory regimes, and expansion of bilateral government procurement commitments, the U.S. and the EU will be capable together of producing the growth and jobs which both economies need to emerge in a sustainable way from the economic crisis. The Chamber believes that these jobs and growth will be created in the U.S. and the EU with the help of the Chamber proposed "Transatlantic Economic and Trade Pact" (ETP). Meeting in Washington on November 28, 2011, the U.S.-EU summit leaders called for the establishment of a High-Level Working Group on Jobs and Growth to be led by U.S. Trade Representative Ron Kirk and EU Trade Commissioner Karel De Gucht. President Obama, EU Council President Van Rompuy and European Commission President Barroso have tasked the working group - in consultation with private stakeholders - to provide an interim report on avenues for transatlantic trade liberalization by June 2012. The U.S. Chamber warmly welcomes this ambition from the U.S. and the EU to pursue the full promise of the transatlantic economic relationship. 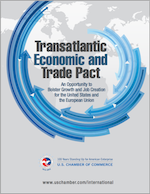 The summit's fact sheet has proposed consideration of ways to create jobs and growth in the U.S. and the EU that closely reflect the Chamber’s proposed "Transatlantic Economic and Trade Pact" (ETP). By dedicating ourselves to eliminating remaining tariff and non-tariff barriers in the transatlantic market, the U.S. and the EU will demonstrate their leadership in unleashing economic growth through trade and in so doing deliver a strong message of confidence to the global economy and markets.